South Carolina quarterback Jake Bentley throws a pass against South Florida during the Birmingham Bowl in December in Birmingham, Ala. Bentley enrolled a year early in college after reclassifying to the 2016 signing class. A quarter century after Georgia quarterback Eric Zeier introduced Southeastern Conference football fans to the concept of early enrollees, Jake Bentley took quick starts at the college level a step further. Bentley was a junior quarterback at Opelika (Ala.) High School in the fall of 2015, when his father was in the second of his two years as an offensive analyst at Auburn. When Bobby Bentley was offered the role of running backs coach at South Carolina under new coach Will Muschamp that December, it left his son in a bit of a predicament. "Was I going to stay in Opelika, or was I going to play in South Carolina at my third high school?" Bentley said at this year's SEC media days. "When I visited (the University of) South Carolina, that's where I wanted to be. I didn't want to be at my third high school for only six months and learn a new offense when I could learn a college offense." So the 6-foot-3, 220-pounder pursued the remote path of reclassifying from the 2017 signing class to the 2016 class. "I had not even heard about that until my 11th-grade year," Bentley said. "We looked at credits and laid it all out. We realized that I only needed one more class to graduate, so I went ahead and knocked that out and skipped my senior year." 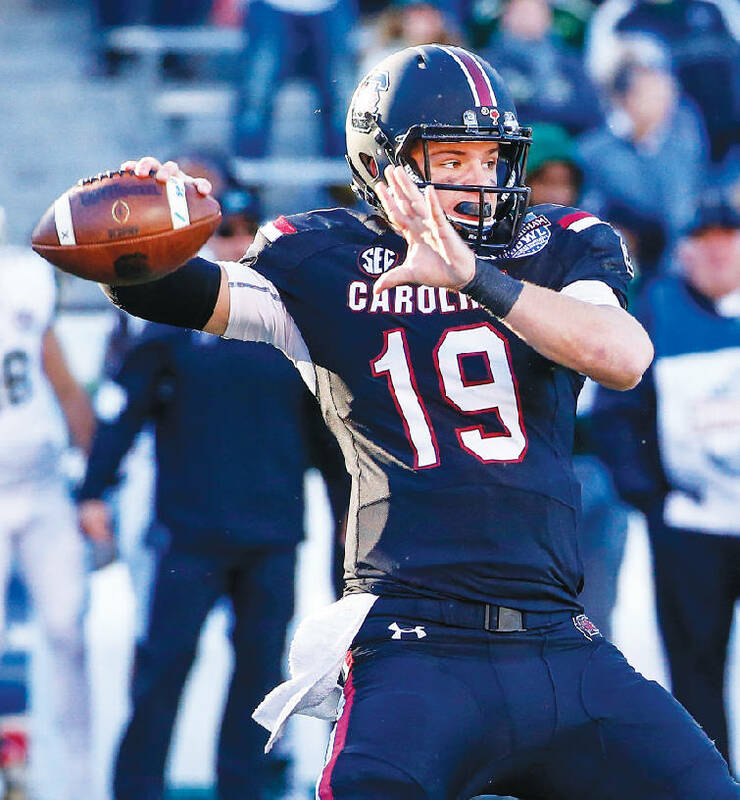 Bentley arrived at South Carolina last summer, and when the season kicked off, it appeared he would redshirt while Brandon McIlwain and Perry Orth battled for the starting spot. Through six games, however, the Gamecocks were 2-4 with a lifeless offense. › Fun fact: Jake Bentley last season became the first true freshman quarterback at South Carolina to win his first three starts since Steve Taneyhill in 1992. After a 28-14 loss to Georgia in Williams-Brice Stadium that resulted in the 2-4 midway mark, the Gamecocks had an open date. "So I went into the office Monday morning, and I told (offensive coordinator) Kurt (Roper) that we're going to open it up." Bentley won the job and won his opener, leading the Gamecocks to a 34-28 victory over UMass. He completed 17 of 26 passes for 201 yards and two touchdowns. "It was crazy, going from getting redshirted to getting a shot in the bye week to taking over the job before the UMass game," he said. "Every week I prepared as if I was going to play, so it wasn't that much of transition to go out there, but it was crazy when it started." Beating UMass was one thing, but Bentley's second test occurred against No. 18 Tennessee. By completing 15 of 20 passes for 167 yards and two touchdowns, Bentley led the Gamecocks to a stunning 24-21 upset of the preseason SEC East favorite. Bentley looks back at that night with deep appreciation, and he can even appreciate his "Welcome to the SEC moment." "Derek Barnett got me a few times on a couple of screens," he said, starting to smile. "I dropped back and flipped it over his head, but he got me and put me right in the dirt. That didn't feel too good. "That was an amazing team win. We needed that game for our team, and it proved that we're capable of anything." November victories over Missouri and Western Carolina helped produce a 6-6 regular season and an invitation to the Birmingham Bowl against South Florida. Bentley wound up completing 125 of 190 passes for 1,420 yards and nine touchdowns with four interceptions in the seven games he played. Now he's one of 10 returning offensive starters on a team that was picked fourth in the East behind Georgia, Florida and Tennessee, so there will be no sneaking up on folks for Bentley and his teammates this year. "When he came in last season, he brought us a spark," Muschamp said. "To see him go through the offseason program to spring ball and now into the summer, he just really understands how to be a quarterback, and that's what excites me. He was voted along with (receiver) Deebo Samuel as a most valuable player by his teammates. "That will tell you something about a guy that played half the season and should have been a high school senior, and his teammates are voting him co-MVP." Bentley admitted there were a lot of mixed emotions in leaving his Opelika teammates. "I told them that I did not want to go play for another high school," he said. "I think they would have been upset had I done that, and they texted me all the time last season and offered congratulations after games. The overwhelming support from everybody at Opelika has been great, and they had a great season, too." And how did his Gamecocks teammates take him in so quickly? "Winning solves everything," Bentley said.